4 Bedroom Detached House For Sale in Bournemouth for Asking Price £420,000. 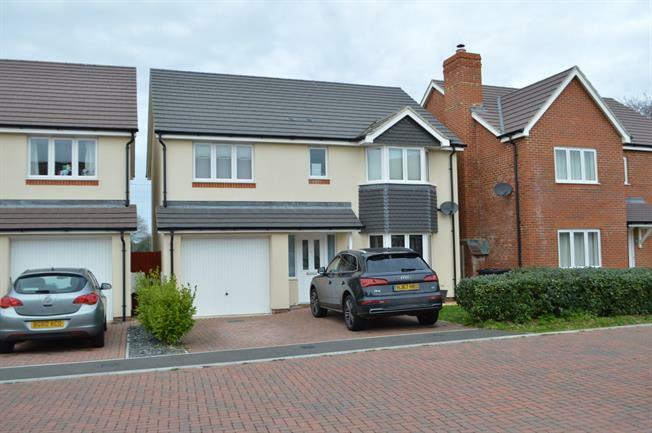 Palmer Snell are pleased to offer this beautifully presented 4 bedroom detached family home situated in a quiet modern development in Muscliff backing onto playing fields and built in 2015 benefitting from a remaining NHBC building guarantee. Vendor suited. The accommodation comprises a spacious entrance hall, downstairs WC, 16'4" lounge, 11'5" dining room, 15'1" modern kitchen/breakfast room with fitted appliances, 4 first floor bedrooms with en-suite and a family bathroom, integral garage, parking in the front for 2 cars and a private rear garden backing onto playing fields. Via UPVC double glazed door. Radiator. Stairs to first floor with cupboard under. Doors to accommodation. Frosted UPVC double glazed window to rear aspect. Wash basin with tiled splash back. Tiled flooring. UPVC double glazed window and French doors to rear garden. Range of wall and base units. Sink. Integrated oven, hob, hood, dish-washer and fridge/freezer. Space for washing machine. Breakfast bar. Radiator. Tiled flooring. Central heating boiler. UPVC double glazed bay window to front aspect. 2 radiators. TV point. UPVC double glazed French doors to rear garden. Radiator. Space for table and chairs. Loft hatch. Airing cupboard. Radiator. Doors to accommodation. UPVC double glazed bay window to front aspect. Radiator. TV point. Custom built fitted wardrobes. Door to en-suite. Frosted UPVC double glazed window to front aspect. WC. Wash basin. Shower in cubicle. Heated towel rail. Tiled walls and floor. UPVC double glazed window to front aspect. Radiator. Custom built fitted wardrobe with matching dresser. Frosted UPVC double glazed window to rear aspect. WC. Wash basin. Bath with shower over. Tiled walls and floor. Radiator. Up and over door. Power and lighting. Door to entrance hall. The front of the property is laid to lawn with block paved driveway allowing off road parking for 2 cars leading to garage. The rear garden which back onto the playing fields has a patio off the property with the remainder laid to lawn. Shed space.